In a quick move that would obviously make Steve Jobs go green with envy. Tesla CEO, Elon Musk unveiled Tesla’s latest product in an over the top presentation at Universal Studios in Los Angeles. Four houses on the old set of popular TV Series Desperate Housewives were refitted with the company’s new and almost unnoticeable solar panel roofing. Using a special coating, the appearance of the tiles changes based on the angle it’s being viewed from . The coating is basically transparent when seen directly but from an angle of the street, it looks just like an average slate shingle or terra cotta style and it does a pretty good job of camouflaging the underlying solar cells. Musk said that they are working with 3M on the coating. Elon Musk also emphasized on the durability of the panels and showed off a drop test comparison between his new tiles versus stone and clay. The solar roof was surprisingly stronger . Pulling out a nice buzzword that should be part of every tech presentation he said, “It’s never going to wear out, it’s made of quartz, it has a quasi-infinite lifetime.” Quasi-infinite baby. A new Powerwall was also presented. It has 14kWh of storage and 7kWh of peak power draw, along with a flatter external form factor. 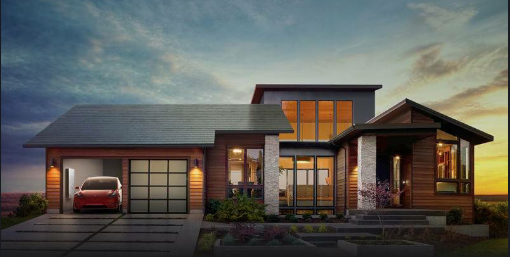 Version 2.0 will be able to power a four bedroom house for about 24 hours on its own.